Club Penguin Cheats by Mimo777 Club Penguin Cheats by Mimo777: TEAM HERBERT! And when I read that, it got me thinkin' too, Anonymous. What if I want to join Herbert's team!? We can be on the good or bad team during the Superhero Party! Why not all the time!? I mean, come on. The EPF is kinda lame, isn't it? Herbert makes all these cool inventions! And what do we have? Big TV's and silly phones... Yeah. It can't just be me and Anonymous that think this! Who's with us!? i agree we should choose the side at all times, but if that would happen, wouldnt the EPF be able to stop herberts plans at all times? I can agree with both sides because I think that we should be able to choose sides on our own. I have a question Mimo777 if people can join Herbert than who would win, who would get the prize. Yeah, go team Herbert! I'm with you guys! i want to! i <3 herbert! Hey penguins, for Earth Day this year, everyone who is an EPF agent should dress up in their full stealth class costume and go to the recycling center and dance. (When you wear your stealth class costume and dance you turn into a recycling bin). Waddle on! but why would penguins be with herbert? ME!!! IM WITH YOU MIMO!! EPF IS SOOO BORING!! 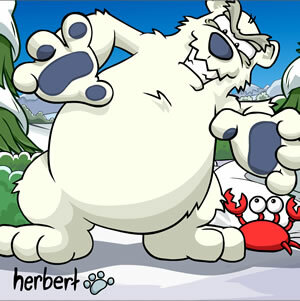 Herbert doesn't eat meat, such as penguins, fish dish pizza etc. He's a vegeterian! We should be respectful! EPF members on my side???? Its a bit late for your silly April fools penguins!!! looks like i have to clean up some dirt. looks like i have to stand alone! Never, Ive been an EPF agent for long enough to say that whoever thought of this is pathetic!! EPF shall always win!!! At the start of or before each mission CP should give a choice of which team we wish to join (if you are EPF and do nothing you are still EPF or else if you go to Herberts secret lair before the party , talk to him and agree to join him ) you become a double agent then if you go tell Gary who will be waiting in the HQ afterwards then you are EPF againand your mission will be crafted to be more interesting , if you are not nor have been EPF then you can either go to the EPF center or go to Heberts lair , if you go to the lair CP won't grant you the ability to become an EPF agent later until the party is over . EPF agents can only defect to Herbert not join then infiltrate the EPF. based on the population who joins and who opposes (like on Neopets) the total outcome and statistics / size of Herbert corps vs EPF will decide which direction CP shall go. 2)Lay penguin and Herbert team member with no previous EPF affiliations. Winning party/team chosen because of it's size like in Neopets. I would join the EPF if they replaced the Director. I miss PSA so much! EPF is just weird. But Herberts Team sounds a bit silly. Being an old PSA agent I can tell you that we ex PSA EPF agents would all prefer to work for Herbert our old friend and enemy rather than under AA who just popped out from nowhere and took over all we loved and held dear. ALL HAIL HERBERT! Down with Aunt Arctic's EPF. What shall this new team be called? I totally agree I think it's time for a little change around whos in charge at club peguin it is time for team Herbert and Clutsy to rise! yeah,i am with you Mimo777 and anonymous.Even i feel like being on Herbert side sometimes. Will probably be really hard for CP and have to change a lot of CP. What if the hot bottle sauce was stolen and Herbet used it?? I wanna join Herbert too! If all penguins side with Herbert rather than the EPF will Herbert be made Director? How about a mission where Herbert comes out of hiding and contests to be included in the EPF and then be elected Director by either rigging it or killing Aunt Artic!!! Herbert is a fail. We should just put him on an iceberg, send him away and put a stop to the EPF. There would be no more threats if the EPF actually did their job and captured Herbert, not let him ESCAPE AGAIN!